8368 ft (2551 m) . 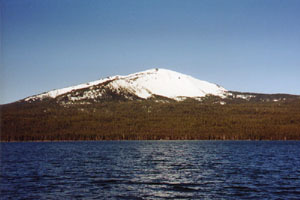 Directly across the blue waters of Diamond Lake from the shapely spire of Mount Thielsen lies the squat, rounded dome of Mount Bailey. 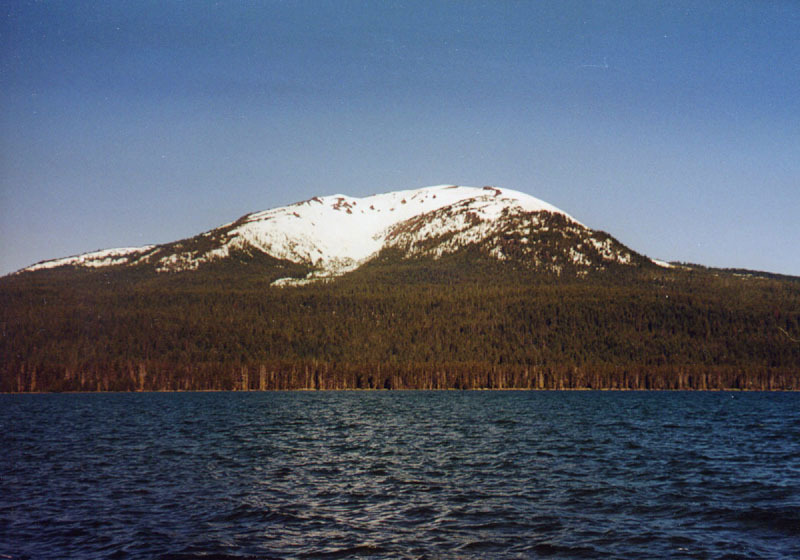 Like Thielsen, Bailey is a shield volcano, but its relative youth means that the forces of glacial erosion have not completely erased its original profile. Nevertheless, massive Ice Age glacial cirques have been gouged into the east and west faces, removing the summit crater and revealing a series of lava pinnacles along the narrow summit ridge separating the cirques. A small, youthful-looking crater can still be found just south of the summit ridge, providing an excellent mini terrain-park within its steep bowl-shaped confines. Bailey's position a few miles west of the Cascade crest results in large snowfalls, although in most years it does not approach the 700-inch (18 m) snowfalls sometimes claimed. A snowcat-skiing operation serves the entire mountain from Diamond Lake resort during the winter and early spring, providing access and avalanche control during the prime powder season. However, human-powered skiers may find it best to wait for mid-to-late spring, since winter access involves several miles of extra travel over snowcovered roads from the nearest plowed highways. 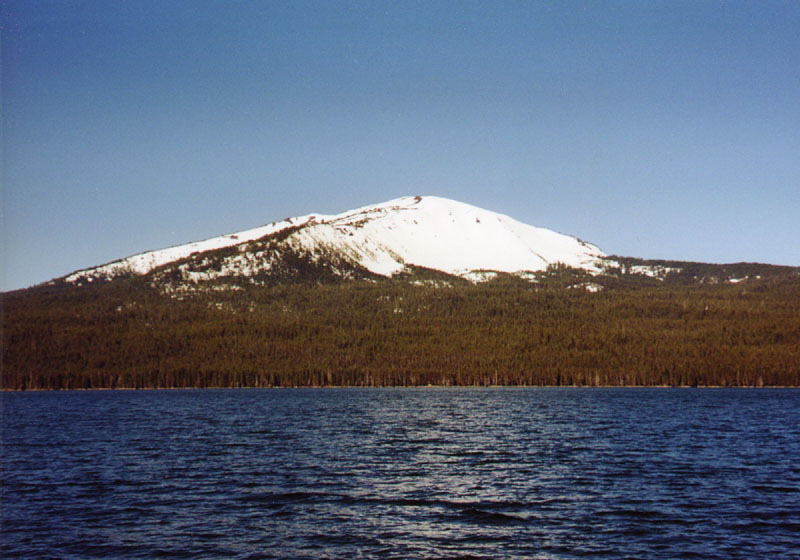 (16 km) The simplest year-round access to Mount Bailey is from the southeast side, where a trail ascends from near Diamond lake to the summit. This route is generally quite moderate, and the lower portions are a marked cross-country ski route in winter. The upper portions of the route contour along the nearly-level summit ridge for almost a mile, making it somewhat less than ideal for snowboarders. 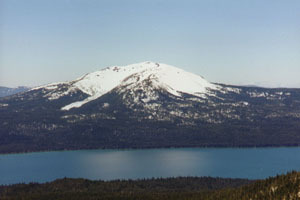 In spring, access begins from the Mount Bailey trailhead, but in winter roads are plowed only as far as Three Lakes Snow Park, adding several miles to the trip. From this direction it is also feasible to descend the South Bowl directly back towards the road from the snow park, providing a much steeper descent. In late spring and early summer, an unmaintained 4WD road allows very short access, joining the summit trail above 6000 ft and making it an easy half-day trip. (18 km) The finest ski terrain on Mount Bailey is found on the east and northeast sides. The most prominent feature seen on Bailey from Diamond Lake is the large cirque and avalanche path of the East Bowl. This leeward slope becomes heavily wind-loaded with snow, and in the 1960s a mammoth avalanche ran from the summit ridge over 1.5 miles all the way down to 6000 ft, clearing a 200-yard wide swath through the forest. In stable spring conditions, the steep upper slopes of cirque provide a variety of choices for dropping into the bowl from the pinnacled summit ridge. Just north of the bowl is the gentler, gladed East Ridge, which is can be reached directly through the woods from the west side of Diamond Lake and leads straight to the true summit. North of the ridge the summit dome rolls away sharply into a series of very steep gullies which lead to the imposing Northeast and North Faces. These provide by far the steepest terrain on Bailey, along with high avalanche hazard even into spring. In addition, depending on the ascent route a lengthy traverse may be required to return to the trailhead. (10 km) The west side of Bailey is quite symmetrical with the east, with a large glacial cirque (the West Bowl) flanked on the north by a gladed ridge (the Northwest Ridge). The terrain on this side is somewhat gentler than the east side, and its windward aspect results in less snow loading and avalanche hazard. 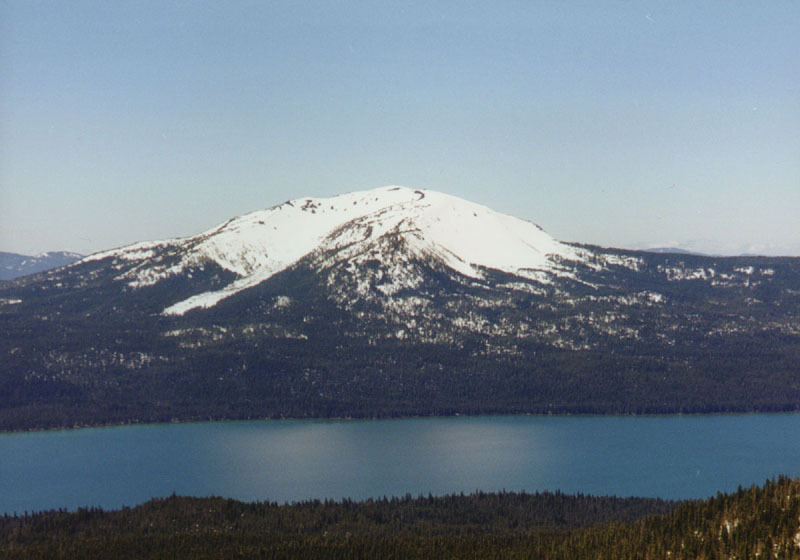 In winter and early spring, access is very long from the Three Lakes Snow Park, but in late spring when the road along the west side is melted out it provides the shortest and most direct access to the summit. Old signs along the road still point to the old west side summit trail, which is unmaintained and no longer marked on USGS or Forest Service maps.